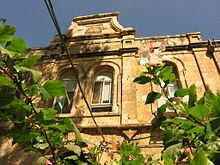 The Ministry of Health (Hebrew: מִשְׂרַד הַבְּרִיאוּת, translit. Misrad HaBri'ut) is a ministry in the Israeli government responsible for formulating health policies. The ministry plans, supervises, licenses and coordinates the country's healthcare services. In addition to overseeing health services provided by Kupat Holim and family health centers such as Tipat Halav, the ministry maintains general hospitals, psychiatric hospitals, mental health clinics, treatment programs for substance abuse and facilities for the chronically ill. The current Minister of Health is Benjamin Netanyahu. This page was last edited on 9 January 2019, at 21:26 (UTC).